This was supposed to be the stretch of the season where the Rangers took over the AL West and allowed themselves breathing room during the month of September. It seemed things could be headed in that direction on August 28, when the Texas offense roughed up Felix Hernandez to the tune of 9 earned runs, sending him to the showers early in what was the worst start of his career. If that was supposed to be a sign of things to come, neither Oakland or Minnesota got the memo. Oakland survived perhaps their toughest 10-game stretch of the season and actually gained ground on the Rangers. Minnesota hit just enough while the Twins pitching staff held the Texas offense in check, taking a three game series that you'd normally expect Texas to win, especially since it was, you know, Minnesota. And so, with all of that, Oakland has now closed to within 1.0 game of Texas heading into a head-to-head matchup of the top two taems in the AL West. 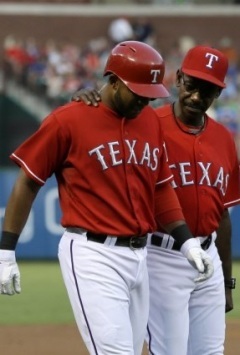 Perhaps the most troubling development over the weekend was the loss of Elvis Andrus early in Saturday's game, as his back tightened up on him while running the bases. He's not expected to play in today's series opener in Oakland, with the hope being that he'll be ready to go on Tuesday. This team needs Andrus. Perhaps Andrus turns the double play that wasn't made by Profar that arguably led to Sunday's loss against Minnesota. Furthermore, Andrus provides energy and speed at the top of the lineup. With September arriving, that means roster expansion time, and that means I'm scratching my head at some of the callups. Jim Aducci, a career minor-leaguer, will get a chance to show whether or not he's worthy of a longer look in the future, but it comes at the expense of keeping Engel Beltre out of a Texas uniform for the time being. Beltre, considered by many to be the best defensive outfielder in the Rangers system, also provides speed when he's in the lineup. Furthermore, I can't understand how he could possibly be considered a worse option than David Murphy when you're talking about left-handed left fielders. Then, there's Michael Kirkman. I suppose if the Rangers plan on being on the wrong side of lopsided games, Kirkman could be considered a decent option to eat up innings. Other than that, I can't see what purpose he serves. I'd be nervous at even allowing him to warm up in the bullpen out of fear that he would manage to give up runs even from there. With the AL West looking to come down to the finish, I'm just not sure how projects like Aducci and Kirkman should be given important roster spots. For my money, I'd love to see a platoon of Beltre and Gentry in left field with David Murphy on the bench, and out of the bullpen, I'd rather see literally anyone other than Michael Kirkman. Darren Oliver, Arthur Rhodes, anyone? All kidding aside, the Rangers now find themselves in the final stretch of the season. The goal? To win at least as many games as the Oakland A's, and anything beyond that is a bonus. For my health, I'm really hoping we get to see that bonus.